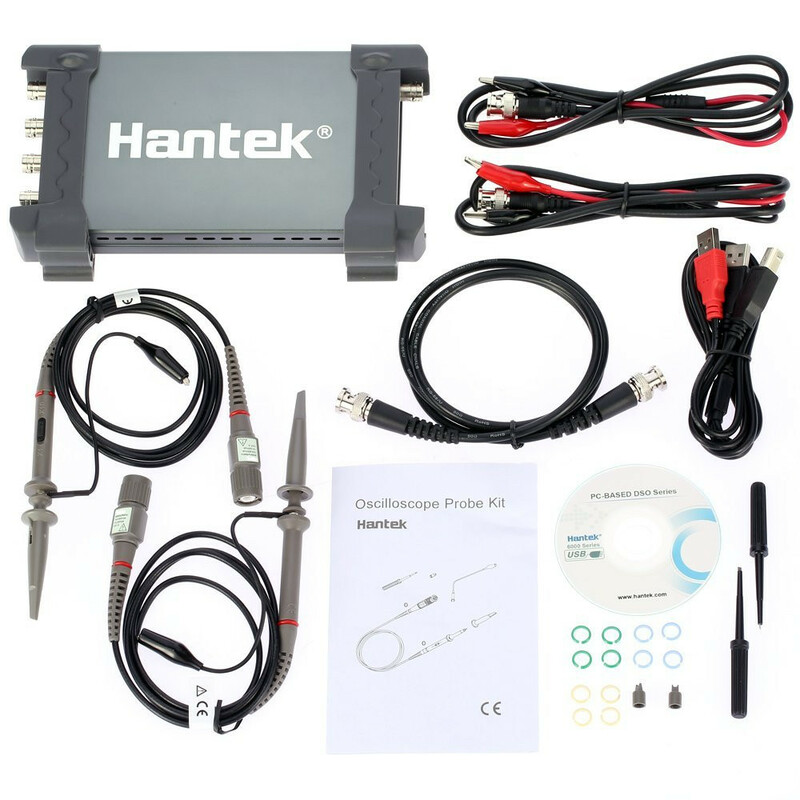 The Hantek 6104BD is a 4 channel​ oscilloscope and arbitrary waveform generator. This digital oscilloscope and arbitrary waveform generator has 4 independent analog channels, 1GSa/s real-time sampling rate, 2mV-10V/DIV input sensitivity, 100MHz bandwidth and Arbitrary Waveform Generator. It is powered by USB2.0 Interface, plug and play device with small size which is easy for carrying. High cost performance, pass/fail test, resourceful trigger function, dynamic cursor tracking, waveform record and replay function. The performance of this model could be even better than the performance of benchtop oscilloscope. It has 4 independent analog channels, 1GSa/s real-time sampling rate, 2mV 10V/DIV input sensitivity, and 100MHz bandwidth. Pass/fail test, resourceful trigger function, dynamic cursor tracking, waveform record and replay function. The operation interface is similar to banchtop oscilloscope, easy to operate with high cost performance. USB2.0 Interface, plug and play device. Fit for the portable computers, table PC, and repairing/fixing of production line. Suitable for business trip use. Software support: Windows10, Windows 8, Windows 7. The waveform data could be output to EXCEL,BMP,JPG as time and voltage category. More than 20 kinds of automatic measurement function, PASS/FAIL Check function, fit for engineering application. Waveform averaging, afterglow, lightness control, reverse, add, subtract, multiply, divide, X-Y display. USBXI standard interface, easy to insert into USBXI case to constitute assembling instrument. Provide secondary development library DLL; Provide Labview\VB\VC\QT developing examples.